You may be aware that there is an increasing issue with harmful content that is available for individuals to view and engage with online. Having experienced and noticed the potentially life threatening impact that this can have on somebody's mental health, we are taking action. 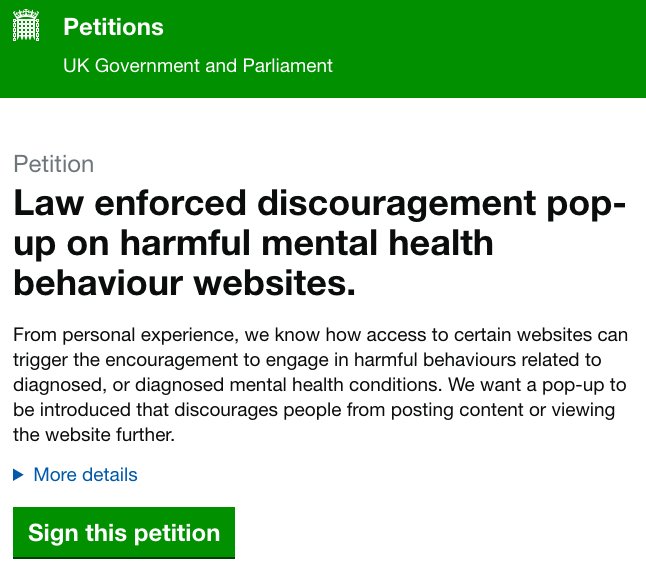 We want the government to implement a law enforced discouragement pop-up on harmful mental health behaviour promoting websites, to make individuals aware that the content they are about to view or post may have a significant impact on their own and others mental health. We also hope that the pop-up could feature a link to a support organisation that may encourage potential viewers to seek help. There have been multiple studies that show the effects of viewing harmful websites such as pro eating disorder, pro self harm and pro suicide. Many list that the participants experienced lower levels of self-esteem, more willingness to engage in activities being encouraged and distorted perception of self. 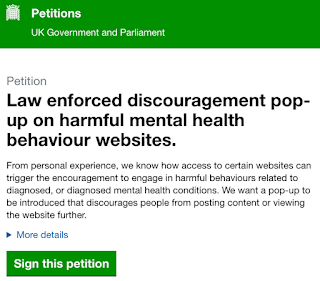 We believe that discouraging engagement and signposting to support would prevent individuals from being negatively affected by these websites. We would very much appreciate your support by adding your signature using the link below in order to see this petition be discussed in Parliament. Changes need to be made and regulations need to be implemented so that individuals are aware of their own actions and the consequences that this can have on mental health and wellbeing. Thank you in advance for your support and please share the link with your family and friends to get the message out there. Help us to gain as many signatures as possible by posting the link to social media accounts, with the #PowerfulPopUp to get this campaign going! We need to start using preventative methods when it comes to tackling mental health, not leaving it until people reach crisis point. Early intervention is key and we believe that enforcing this pop-up will be a step in the right direction.